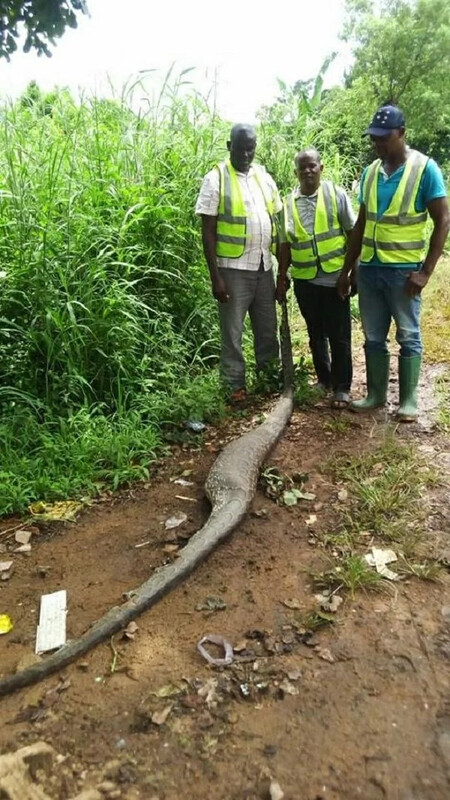 Let Us Learn: People are often fearful of large pythons and may kill them on sight. The African rock python may also be threatened by hunting for food and leather in some areas. Little information is available on levels of international trade in this species. Some of the African rock python’s habitats are also known to be under threat. For example, mangrove and rainforest (same habitats we claim are under threat in Nigeria) habitats and their snake communities are under serious threat in southeastern Nigeria from habitat destruction and exploration for the oil industry. So, reading a few hours ago of how a current commissioner of environment in Delta killed a Python (most likely an African rock python) while carrying out an inspection exercise, was not only disturbing, it got me really thinking about how deep in a mess we might be in Nigeria. 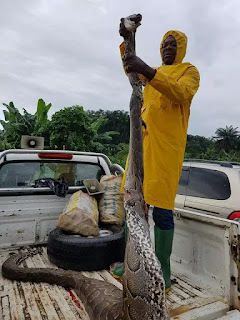 "Hon Comm for Environment, Hon Barr John Nani and his team encountered and killed a 3.6m python at Anwai during canal opening which will control Asaba flooding. Let Us Learn: The natural environment encompasses all living and non-living things occurring naturally, meaning in this case not artificial. The term is most often applied to the Earth or some parts of Earth. This environment encompasses the interaction of all living species, climate, weather, and natural resources that affect human survival and economic activity. Consider it from the health perspective. It is more like a commissioner of health that has just led to the death of a patience in a state hospital! What is the role of a Commissioner of Environment? Should he not be working towards protecting and conserving the environment (which should include the snake right? ), while ensuring that the environment remain habitable for human beings? In this particular case, the Python (a non-venomous snake) was of no threat to him or his team as it had just fed. The questions are endless... So are our problems in this part of the world. How does this Commissioner preach to a people that might be in need of fire wood, not to cut down trees? How does he explain to a people in need of a source of protein that every animal in the wild has its role to play in the ecosystem and must be hunted with caution? What right does he have to query oil companies against oil spillage because it posses a threat to the natural environment when he is already playing a part in destroying nature? Do we have a Wildlife protection or conservation act? So what do we really do when we join the United Nation in their campaign against global warming, conserving the environment, destruction of wildlife and other natural resources? Has this man not just destroyed something he should be protecting? Is he not part of the problem he should be trying to solve? While we continue in this struggle to right the many wrongs in Nigeria, let us be aware that most of our problems are created by us, the man or woman in the mirror, through our laziness, ignorance, deliberate lack of knowledge, politics, how we have defined religion and more.